The golden age of English theatre spanned the reigns of Elizabeth I and James I. It was overwhelmingly a London phenomenon (although productions did tour, especially when the plague was raging in the City), and is not really matched in any of the other major cities of Europe, where the main cultural achievements of the late Renaissance were in the fields of painting, sculpture, architecture, and music. We have already looked at this in relation to Christopher Marlowe, but his career was cut short by murder, and his reputation, in modern times, has been eclipsed by that of his longer-lived contemporary, William Shakespeare. 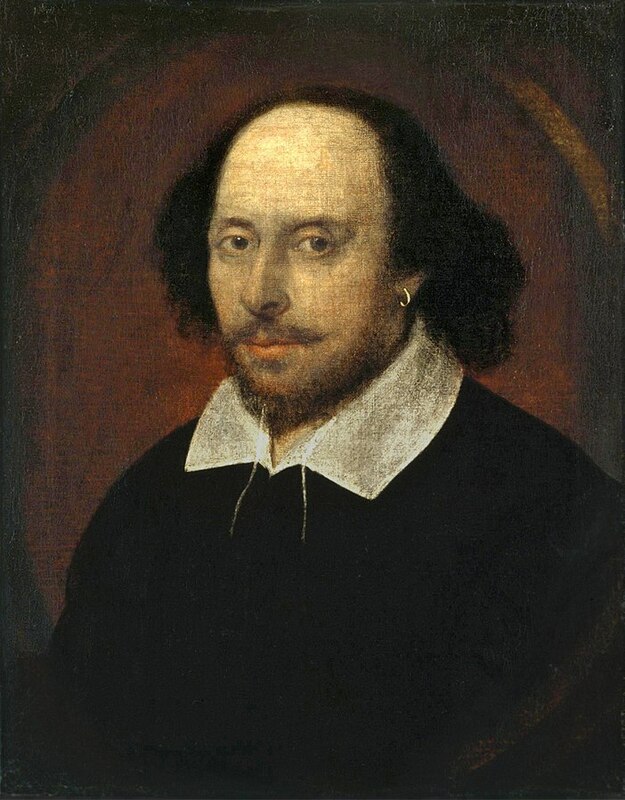 William Shakespeare, by John Taylor, 1610 (The Chandos Portrait). Image: National Portrait Gallery (Public Domain). Unlike Marlowe, Shakespeare did not have the advantage of a university education (he might, perhaps, have taken a degree at Oxford, had his family not fallen upon hard times, the result of ill-advised business risks taken by his father). Shakespeare probably arrived in London some time between 1585 and 1592, and joined an acting troupe, the Lord Chamberlain's Men, who staged productions at The Theatre in Shoreditch. He soon began writing, as well as acting, attracting the jealousy of rival playwrights. Robert Greene (when did we last see a play of his performed?) wrote, in 1592, that " ... there is an upstart crow, beautified with our feathers, that with his tiger's heart wrapped in a player's hide, supposes he is as well able to bombast out a blank verse as the best of you; and being an absolute Johannes Factotum is in his own conceit the only shake-scene in a country." 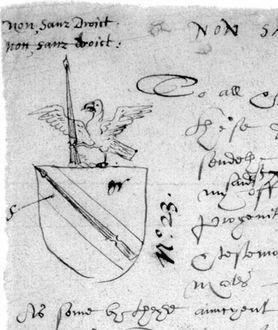 Coat of arms procured by Shakespeare for his father, 1596. Image: College of Heralds (Public Domain). 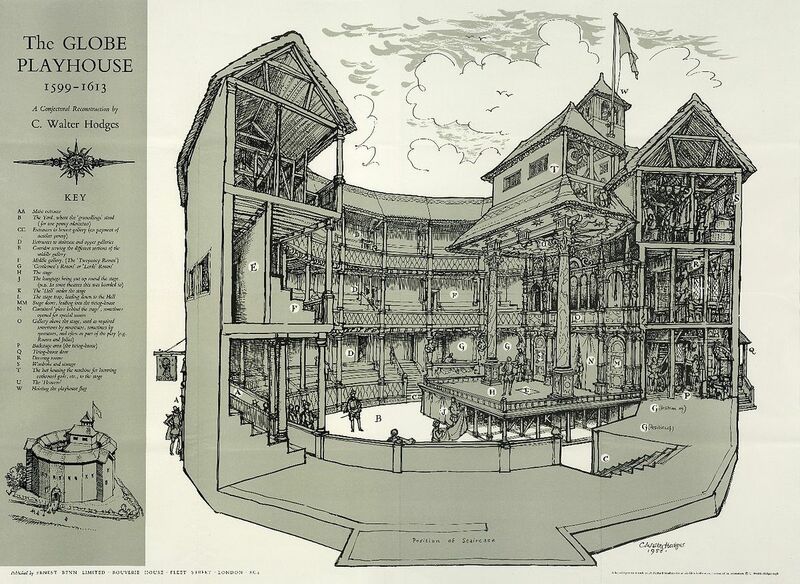 The Theatre had been built by James Burbage, the father of the actor, Richard, who played the leading roles in many of Shakespeare's plays, but the lease on the land expired in 1599, and the actors, assisted by a carpenter, dismantled the theatre, and transported the timber, beam by beam, across the Thames. 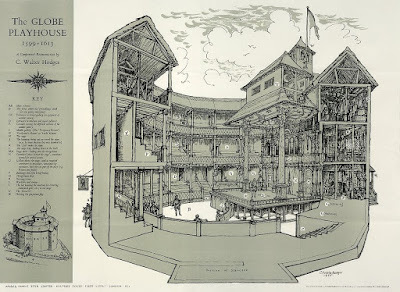 Their new theatre, The Globe, opened in 1599, and it was here that several of Shakespeare's plays, including Julius Caesar and Henry V, were first performed. 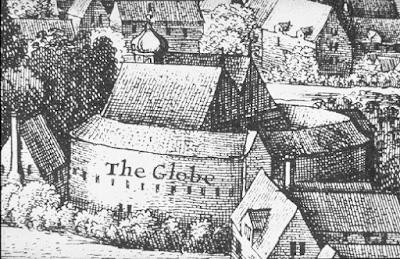 The Globe in 1647, by Wenceslaus Hollar (image is in the Public Domain). 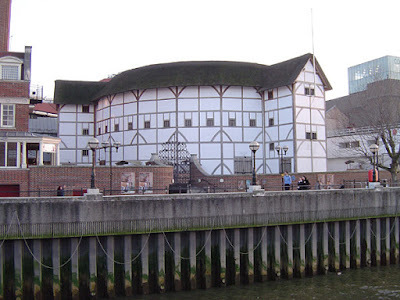 The reconstructed "Shakespeare's Globe," opened in 1997. Photo: ChrisO (licensed under GNU). The original location of The Globe. Image: Old Moonraker (licensed under CCA). 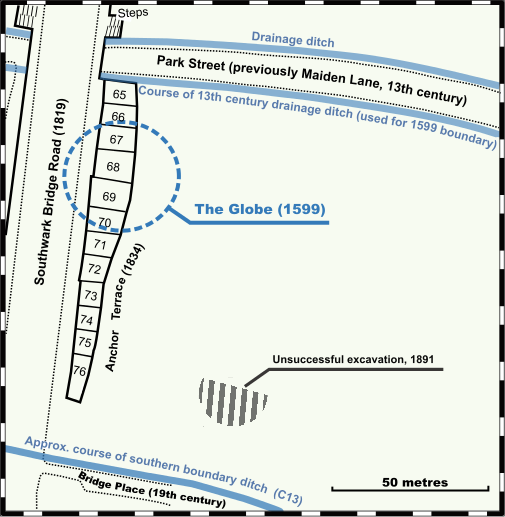 Conjectural reconstruction of The Globe, by Walter Hodges (1958). Image: Folger Shakespeare Library (licensed under CCA). Shakespeare's true home was always in Stratford-upon-Avon (in London he lived in rented rooms), and he retired there in 1613, dying three years later. In 1642 the theatres, including The Globe, were closed by Parliamentary decree, marking the end of the London theatre's golden age. 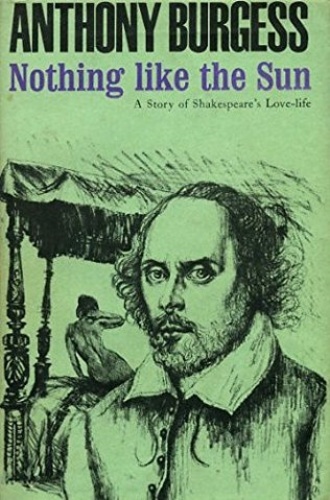 Anthony Burgess's novel, Nothing Like the Sun, follows Shakespeare's perambulations between Stratford and London, and explores his personal and professional relationships, including his romantic entanglements with both women and men (of the private life of the historical Shakespeare we actually know very little, although there are good reasons for believing that he may have been, in modern terms, bisexual). 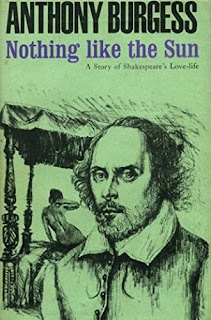 The novel presents a vivid picture both of Shakespeare's (imagined) character, and of the London through which he walked. Long View of London, by Wenceslaus Hollar, 1647 (image is in the Public Domain). Panorama of London, by Claes Visscher, 1616. Image: Library of Congress (Public Domain). "Far from the river now. North of the divers fair and large builded houses for merchants and suchlike. North even of the City Wall and the fair summer houses north of the wall. Good air in Shoreditch. The Theatre a finer playhouse than The Rose. Burbage as good a man of business any day as Henslowe and an old player too, though, from what I see, of no great skill. But now, his son promises, this Richard. He may yet go further than Alleyn. Is that Giles Alleyn from whom old Burbage got the land of Ned's kin? It may be so. In '76 it was. A lease of twenty-one years. A mere patch with rank grass and dog-turds, even a man's bones they say. A skull grinning up at the surveyors. And now a fair playhouse. Twenty-one years, let me see. To '98, which is but four more. Will this Alleyn renew? Were I he I would not. But it is the men more than the playhouse, sure. The Lord Chamberlain's Men." "Let me take a breath, let me take a swig, for, my heart, she is coming. She is about to make her entrance. 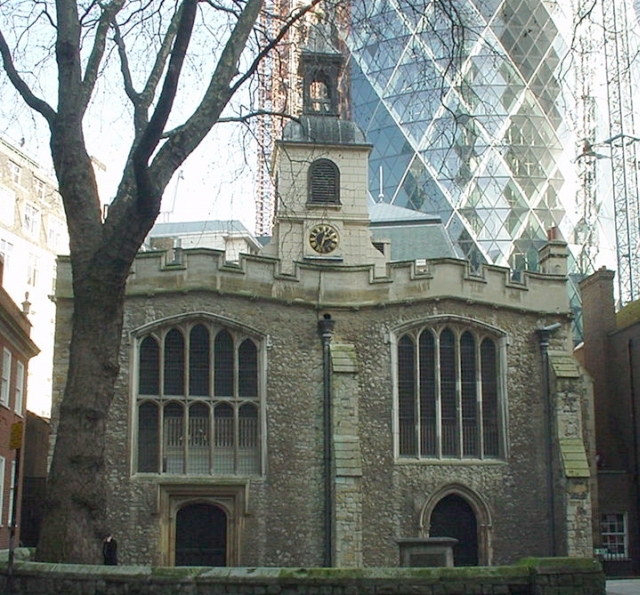 It was while he was walking off Bishopsgate - Houndsditch, Camomile Street, St Helen's Place, St Helen's Church - that he saw her. She stepped from her own coach outside a house near St Helen's, escorted by her unveiled maid. But, in the fresh fall wind, her veil lifted an instant; he saw. He saw a face the sun had blessed to gold ... They were rehearsing Romeo at the Theatre when, in a break or brief ale-intermission, he asked old James Burbage ... 'There be many tales touching her origins. Her own story is (or they say so) that she was brought back as an infant from the East Indies by Sir Francis Drake himself, in the Golden Hind that lies at Deptford now. It is said that both her father and mother were a sort of noble Moors of those parts and were killed by Drake's men in a fight they had there, then she was left all alone and weeping and so, in pity, was brought to England to be in a manner adopted.'" 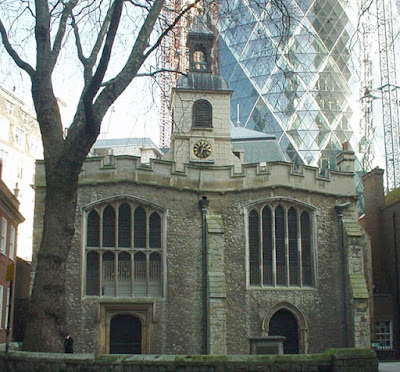 Saint Helen's, Bishopsgate, where Shakespeare was, for a time, a parishioner. Photo: Lonpicman (licensed under GNU). "They have relented: we may play again. With three new petals that to us be thorns. And are three masts now for the Admiral."